The next day, Dan and Tim had the opportunity to deliver two presentations. (You can see them in action to the left.) In the morning, Tim presented "Starting Smart with Oracle Advanced Analytics". 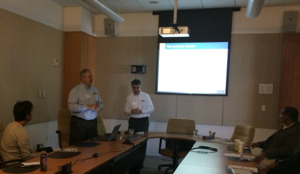 After a tasty lunch, Dan and Tim led a session called "Data Visualization for Oracle Business Intelligence 11g". Both sessions were well attended. If you live in or near Omaha, and you haven't had the chance to attend the Heartland OUG meetings, then you should check them out. It is a well-run group, and their meetings are informative and a great way to network with other Oracle users in the area. Generally they have meetings twice yearly, in the spring and the fall. They are always interested in speakers and sponsors for the meetings. For more information on speaking, sponsoring or attending this great event, take a look at their website, or send an email to ron@heartlandoug.org.